Wire badges for private individuals, clubs, schools, and military units. Bullion wire badges combine gold, silver and copper bullion wire with other decorative components such as hollow beads and silk threads to produce badges which are highly prestigious. The badges are slowly assembled by skilled craftsmen, using time honoured methods & materials. 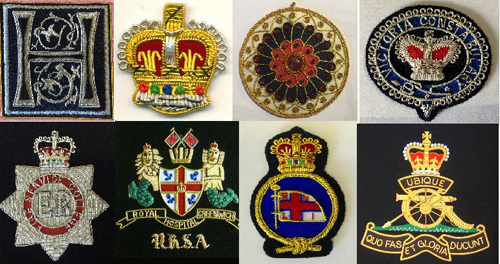 Wire badges can be any size or shape but usually if they are to be used as sew on blazer style badges they would be up to say 8cm width with height to suit. They can be any shape with the backing felt cut to match the shape of the design. Our largest wire panels to date measured 30cm x 40cm. We have supplied wire badges for religious organisations, sections of the armed forces, tourist attractions and other government departments. We are able to duplicate any existing badge or we can work from good artwork. If you have no artwork we can provide graphic design services at a typical cost of £30.00 plus vat. A first sample can be made for approval prior to a whole order being produced if required. Discounts are available for large orders. Send your artwork to sales@waughgroup.com. There are no set up or design charges. Delivery timescales from order placement to final delivery are typically 30 days. There are no minimum order quantities. We can supply one-offs. If you would like a detailed quotation please email an image of your badge or your design to sales@waughgroup.com or phone 01425 489483. 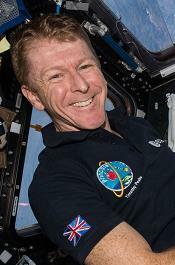 STOP PRESS - Congratulations again to Tim Peake, the UK's astronaut who will spend another tour of duty on board the International Space Station. We are honoured to have supplied badges for use on his flight uniform & polo shirts.
" Thanks for the badge , its excellent , exactly what I was looking for . Brilliant quality... many thanks for a superb badge."